I have never reviewed Mageia before and there is a reason for that. Mageia has always been my “Eleanor”. The “Eleanor” reference comes from the film “Gone in 60 seconds” and refers to the one car that Nicolas Cage cannot steal because something happens when he tries to do so. Mageia has always given me that sort of a problem. I tried Mageia 1 and 2 without success and rather than write a bad review I decided to write nothing at all. Mageia though appears to be one of the more popular distributions and I can’t just go on in this fashion. Therefore I have installed it, tried it and now I am going to tell you about my experience. Other people may well have a different experience to me but as I say, Mageia is my Eleanor. 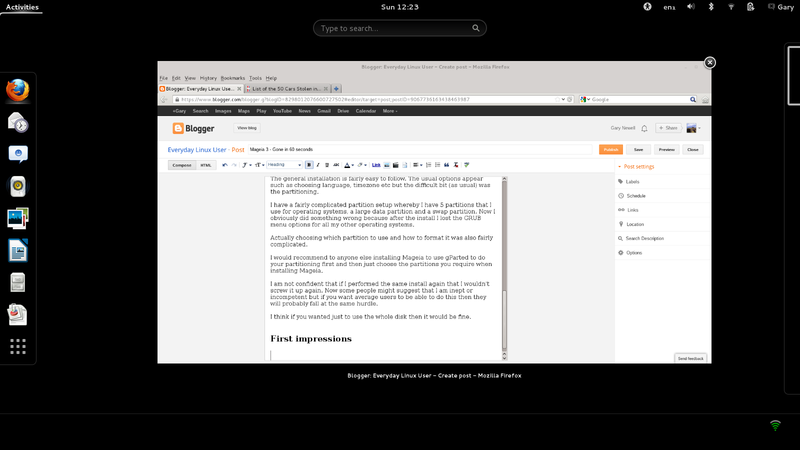 This is a review of the Gnome version of Mageia 3. The first thing that you need to note about Mageia is that you can’t just use unetbootin to produce the USB drive. However I tried all the ways listed on the Mageia site to produce a bootable USB drive and none of them worked. I even tried multiple USB drives in case one was faulty. There was nothing doing. I kept getting to the Mageia loading screen and it just hung there. I ended up therefore writing the Mageia image to a DVD, and this booted successfully. I always do a few checks before installing such as checking the internet connectivity to make sure that I won’t have issues after the full install. 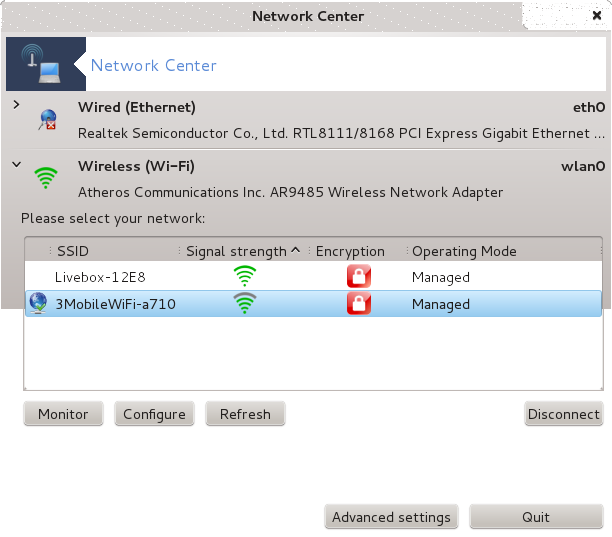 The network icon on the Gnome panel showed no networks available. I fixed this but I will go into more detail about that in the “Connecting to the internet” section. The general installation is fairly easy to follow. The usual options appear such as choosing language, timezone etc but the difficult bit (as usual) was the partitioning. I have a fairly complicated partition setup whereby I have 5 partitions that I use for operating systems, a large data partition and a swap partition. Now I obviously did something wrong because after the install I lost the GRUB menu options for all my other operating systems. Actually choosing which partition to use and how to format it was also fairly complicated. I would recommend to anyone else installing Mageia to use gParted to do your partitioning first and then just choose the partitions you require when installing Mageia. I am not confident that if I performed the same install again that I wouldn’t mess it up again. Now some people might suggest that I am inept or incompetent but if you want average users to be able to do this then they will probably fall at the same hurdle. I think if you wanted just to use the whole disk then it would be fine. Mageia comes with a pretty standard desktop. Panel at the top and a very open space underneath. I like this minimalistic view. The first thing I noticed though was that when I pressed the super key to bring up the dash the background was completely black. I have tried a number of things to change this background but I can’t work out where to change it. Changing the desktop background, however was quite easy. click on the desktop and choose “change desktop background”. There are 3 views available “Wallpapers”, “Pictures” and “Colours”. There is only 1 wallpaper installed by default. (I installed via the live DVD, maybe there are more if you use the full Mageia download). Everyone always ends up choosing their own image for their background anyway, don’t they? The Gnome desktop comes with a single panel at the top of the screen. On the left hand side of the panel is the “Activities” option which when clicked brings up a launch bar, search box and the open applications. In the middle of the panel is the clock which can be synchronised with the Evolution email client to store scheduled tasks and meetings. On the right hand side is a list of icons. From left to right the icons are for accessibility, language settings, audio, bluetooth, networking, power settings and user settings. 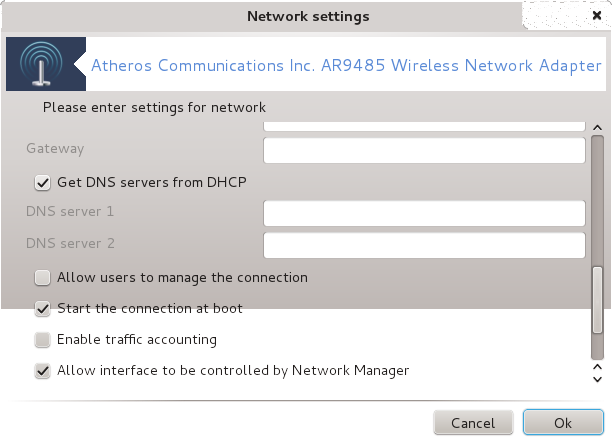 Normally when connecting to the internet within Gnome I would select the network icon on the panel and a list of wireless networks will appear. With Mageia this doesn’t happen. What you have to do is open the network center application and then configure you networks within this application. Setting up the networks in here is quite easy. Simply choose whether you want to configure the ethernet connection or wireless connections. If you are configuring wireless connections, choose the one you wish to configure and click “Configure”. From the configuration screen you can do 2 things. Firstly you can enter the security settings for the network. The other thing you can do is “Allow interface to be controlled by the Network Manager”. As soon as you do this the network icon starts working on the Gnome panel and not only that but all the other networks start appearing on the Gnome panel. I read the documentation regarding Mageia and by all accounts Flash and MP3s were supposed to work straight away. I can confirm that MP3s were perfectly fine but when I loaded Firefox and went to Youtube I received the missing plugin message. To install the plugin I had to go to the package manager (rpmDrake) and install the flash-player-plugin. Now this wasn’t as easy as you might think and I will get to that in the “Installing applications” settings later on. The flash-player-plugin causes a download of the Adobe Flash plugin and this has the desired effect. I used the Mageia 3 Live DVD Gnome edition so there may not be as many applications as the full version but there is a decent selection on offer. To see a list of the applications installed within Mageia press the super key and choose the bottom icon on the Gnome launch bar. On top of the above mentioned applications there are a number of standard tools such as partitioning tools, calculators, notepads and screenshot tools. 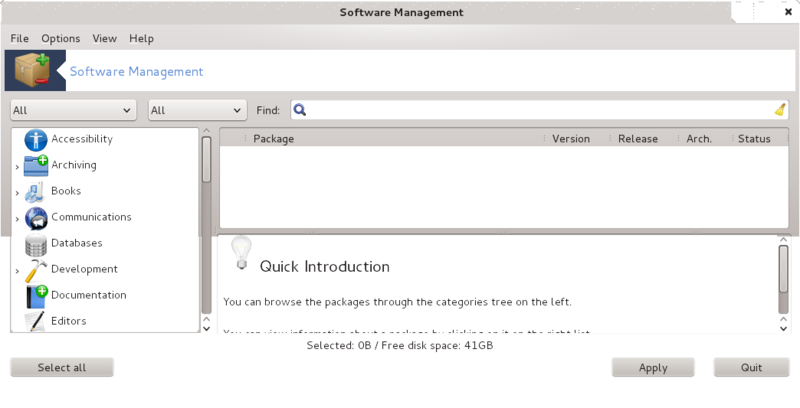 To install other applications you have to use the “Software Management” tool (rpmDrake). I first used this to try and install Flash but the Flash installer wasn’t available in the repositories. I also noticed that I couldn’t install Chrome, Chromium and a number of other applications. Under the options menu there is a media manager section. As I mentioned previously I used the live DVD to install Mageia and because I did that there were only 2 repositories available which were the live DVD and live DVD updates. To get a full list of repositories I had to remove the 2 DVD options from the list and then click the “Add” button. This had the effect of pulling in a large number of repositories. As this is the Gnome version I just wanted to cover a short section about Gnome. Gnome 3 and Unity share common ground. The main difference is that in Unity the launcher is always shown whereas in Gnome the launcher only displays when you select the activities menu or press the super key. Navigating Gnome is fairly simple, especially when you get used to the various key combinations. 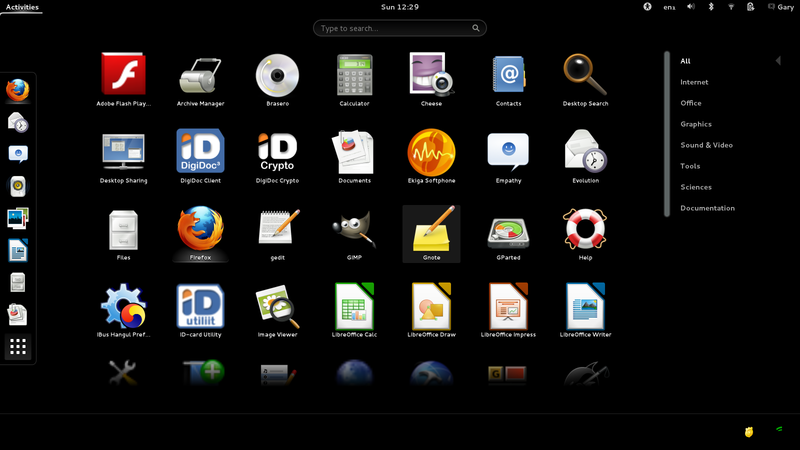 The Gnome dash view has a launcher and either a list of open applications or if you select the applications icon, a list of installed applications. From the open applications you can choose to use a different workspace by clicking on the panel on the right hand side. What you will notice by default is that applications may open but they might not be maximised and you will notice the absence of a maximise button. Double clicking on the bar at the top of the application toggles the maximised state. If you prefer a more traditional view you can use the Gnome Tweak tool. You can adjust a lot of gnome settings using the tweak tool. For example on the “desktop” view you can choose which icons appear on the desktop. You can adjust icons, mouse settings, clock settings, themes and how windows react to mouse clicks. To add maximise and minimise buttons to your applications select the “Shell” view and then change the value of “Arrangement of buttons on the titlebar” to “All”. Mageia and I don’t get on very well. Whilst Mageia certainly has it’s good points, there are a number of things that just don’t sit well with me. The installer needs to be improved, especially with regards to partitioning and the Grub installer. It would be handy to have the networks available from the network icon straight away as I had to go searching for it and somebody new to Linux might not know where to look. The installer should include the list of repositories from the start. I shouldn’t have to remove the live DVD repositories to trigger a download of the online repositories. I also have no idea what is going on with the Gnome theme to make the dash background black. (Maybe somebody can point me in the right direction in the comments). There are some good points. The choice of applications means that I can do most things as soon as I install the operating system. I have also received no crashes whilst using Mageia 3 and the notifications work well without being in your face. The thing that bothers me is that Mageia is clearly so acceptable to so many which means there is something that I am missing. I would like to know why nobody else experienced the same issues as me. Alas, once again, I don’t think I will be sticking with Mageia 3… in fact I think it will be gone within 60 seconds. What qualifications do you need to get on in the world of IT? The partitioning issue is actually well known and difficult to solve. It really only affects those users who have multiple distros on one box. It is caused by the fact that different partitioning tools are NOT compatible with each other. Thus if you are pre-partitioned with gparted, diskdrake will NOT be able to properly interpret your partition table. The reverse is also true. A system with a diskdrake partitioned drive will cause problems with gparted. The best solution is the one you have suggested. When adding new distros to your box, always be sure that the drives are PRE-PARTITIONED to accommodate the new distro. The grub installer is another similar issue. When installing a new distro, NEVER install its bootloader. Instead, skip that step and boot one of you existing distros and ADD the new one to your existing bootloader. Otherwise the new distro will overwrite your existing one OR the new distro may have a bootloader that is incompatible with your existing bootloader and you will end with a similar effect. Apps like Flash and Chromium are available, but they are in different repositories labeled "nonfree" or "tainted" in order to separate them from GPL software. Regarding the boot loader: I always install it, but on the boot sector of the root partition, never on the Master Boot Record. I installed my own GRUB copy into the Master Boot Record, independent of any Operating System installed, and make it chainload any Operating Systems that I wish to boot…; chainloading works since I install the boot loader of any Operating System onto the boot sector of its root partition. This is not correct. A partition table is just a partition table. Whether you use gparted, or diskdrake (the Mageia partitioning tool) doesn't matter. If you read through this discussion it explains WHY you can mix partition managers. Partitions are quite complex in the options available for setting up the partition table. Partition managers are limited in how they can decipher those options. You can ignore this advice, but in the end you will suffer for it. It is much easier to just have a primary system and do all the common partition and bootloader stuff with that. luvr outlines a different approach for bootloader management which is a perfectly good option as well AND it provides a backup plan if the mbr bootloader ever DOES get messed up. Great suggestion luvr! Sorry, the above SHOULD have read "why you can NOT mix partition managers". Anonymous you answered all the problems that I had about the problems with trying Magia, I love the way it works but trying to get it to works, was hell now I know how to do it. Thank you so much!!! Excuse me Anonymous, but partitions created by gparted will *always* be recognized by Mageia's diskdrake, as long as they are formated with a filesystem that has been installed in Mageia, which normally includes all popular Linux filesystems. The problem with diskdrake is that it does not completely recognize the gpt partition tables, which have started to appear on some new computers. It can read them, and read and write to already formatted partitions defined in such tables, but cannot create or delete or modify such partitions. This is something that Mageia inherited from Mandriva, of which it is a fork. This issue has been recognized and is intended to be corrected by Mageia 4, the next version. If you don't have a gpt partition table disk, and you understand disk partitioning, it should not be necessary to pre-partition your disk. But it won't hurt to do so. Proprietory software like flash is in the nonfree repos, as mentioned. The reviewer claims having read the documentation for creating a bootable USB key, but obviously didn't understand. The tool unetbootin is simply not appropriate for Mageia. All Mageia ISOs are USB ready, which means that one has simply to copy the ISO directly to the key, in place of any partition table. Adding buffer size parameters would speed the transfer. Some factors mentioned as problems, such as internet configuration, are done during install from a classic (non-live) ISO, which is quite fluid. But a live ISO install just copies the configuration to disk, so such steps could be done after. The reviewer doesn't say whether a CD or DVD was tested, so it is difficult to guess as to why there were other problems. Although I find your review a bit biased, I congratulate you for trying Mageia and writing it. Everyone has his/her preferences; I'd probably say something similar reviewing Ubuntu. Mageia is basically a KDE distro, so I think that its implementation of Gnome is not very refined… but that's my opinion. I don't use Gnome. The network center is also inherited from Mandriva. Mageia does not use KDE's or Gnome network applets. So, no surprise it is not "integrated". However, when I was new to Linux (absolutely no KDE/Gnome experience), I did not have any problem finding it: it's in the Control Center! Your comment about a newbie not being able to find the network springs from your own expectation as a Gnome user. Believe me, we newbies have no problem thanks to the convenient Control Center. I suspect that some of the issues you described are the result of installing the Live version. The full DVD has corrected many pesky issues in my Mageia 3 KDE install. Maybe it does the same for a Gnome install? Again, thank you for the review. Actually, except for the annoying fact that recent versions of gnome favour a black background, none of his problems were related to gnome. Myself being a longtime Mandriva/Mageia user that has installed both very easily on many other user's computers. Who appreciate the ease of use of Mageia. if you have linux, the dd command works. but for windows rufus (very nice and useful) and more programs do not work. I was using mageia 3 for a while and must say I can't understand its popularity. I am glad you have said it! I have tried Mageia every step of the way since it was an alpha and I have NO idea why it is popular. Every Live disc tryout and every install was completely bug ridden and there is so little knowledgeable or consistent response from those who try to help solve a problem. Stuff like sound not working on videos, a shortage of essential codecs, even VLC doesn't work OOTBox! I say its just a fad that will fade away as people REALLY get down to working with Mageia – because in so many ways, Mageia just does not work – regardless if you install KDE or GNOME. If people want a Mandriva-based OS that just works OOTBox, try PCLinuxOS. Strange. Except for some inevitable glitches with Mageia 1, I found Mageia much better than Mandriva. The founders had some clear ideas on how to improve on Mandriva, which were evidently well founded. Well Anonymous, VLC works OOTBox for me. I never had no sound on videos. Not had anything like as many bugs in Mageia as when I tried OpenSUSE, Fedora, Ubuntu. It just works, using KDE. Typically, when installing from a USB flash drive and the system hangs on booting, I will reboot and edit the boot line to include acpi=off. I don't know why but on my system installing some Linux distros require that switch when booting. Try that next time when you are testing a new distro that doesn't boot, it might just do the trick. I find that my experience pretty much matches the reviewer's. I used Mandriva for many years, so I eagerly awaited Mageia's first release. I *wanted* to like Mageia, but I just couldn't. Instead, using Mageia was an excruciating "death by 1000 small cuts." I tried again with Mageia 2, and it was still just as "unfinished" as Mageia 1. By the time Mageia 3 came out, my migration to Debian was already complete. One small correction: DistroWatch Page Hit Rankings notwithstanding, Mageia isn't really all that popular. There was an extensive discussion at DistroWatch a few months back that convinced me and several others that Mageia's high position on the PHR list is actually the result of verifiable click fraud. So you and some mates got together and agreed that I suppose and now you feel justified in bad mouthing other's work across the internet. I can agree that there were some problems with Mageia 1, but nothing major, relative to Mandriva. Mageia 2 being considerably better than Mandriva, which had been getting increasing problems with each release. For the Distrowatch stats, it is true that a lot of downloads were just people curious about the new distro, particularly since Mandrake/Mandriva had a longtime reputation for ease of use, and the Mageia fork was promising to continue this. But with all the involvement at various levels in Mageia, which far surpasses Mandriva in recent years, to accuse anyone of fraud for those stats is totally unfounded. In my mind, downloads fueled by curiousity only somewhat overstates Mageia usage. The problem with Mageia is that they try hard to make new packages compatible and there goes their time in. They need to make time to bring Mageia to 2013 once for all. The one point missing from all the "valuable" comments on the article is that made by the article author that the issues raised – and shown how to correct by commenters – are not what should be encountered by "first time"or inexperienced Linux users. I have used, trained, supported and taught about Linux in general and for several distributions for fifteen plus years, in corporate, educational and community sectors. Fortunately many distros like Ubuntu, LinuxMint, PCLinuxOS and others have made it possible for millions of Windows users to easily migrate to a more secure, reliable and viable end-user computer experience. However I must also acknowledge my own experiences – in 'comprehensive' test usage – with Mageia 3.0 as "less polished" that those I listed above for the average Windows PC user. The server edition, with renowned "Puppet"Admin tools is still being evaluated, and maybe that is where Mageia will shine. 1) Using gnome tweak tool select adwaita as gtk+ theme. See if it makes any difference. 2) Uncheck the option "have file manager handle the desktop (usually works, but it's not convenient). 3) Raplace nautilus with nemo as the default file manager. If you go to all the time and trouble to make a Linux distro and you want people to leave Windows and use your creation then give them a little help. Make sure that it will install to a flash drive from within Windows using Unetbootin, LinuxLive USB Creator, live.learnfree.eu's Live USB Install, or Universal-USB-Installer. I've never been able to get a Mageia Live to work. If you tell a Windows user or even some new linux users to ""dd name.iso if then sdd2" their eyes will glaze over. Sorry, not a good idea. At least Unetbootin. Mageia ISOs are directly bootable on USB devices. What is wanted is something that simply copies the ISO to the USB key. These applications are suggesting formatting the key as fat, then copying the files on the ISO to the key. 4) it requires an msdos compatible bootloader, which will not necessarily be available. "their eyes will glaze over"
The Linux experience is by default "more difficult" than using Windows merely because Linux (any distro) is different. Now, saying that Windows users will be put off by that is an over generalization and an unfair statement. I migrated to Mandriva without knowing anything about Linux. My mother now uses Pardus. My brother uses Mepis. My wife uses Mageia and we are plain computer users who wanted to abandon Windows. I guess that's the bottom line: regardless of how "simple", "intuitive",or "easy" your favorite Linux distro may be, computer users who are unwilling to learn will always go back to the Windows paradigm. They won't stay with Linux because they could find the network or they booted a live distro easily. I have seen it many times and I am sure all of you have, too. So, please stop dismissing the hard work of Linux volunteers on the hypothetical case of what will please Windows users. Utter Sheepdip! No one is criticizing the Mageia volunteers other than for what simply HAS to be said if Mageia is correct itself and survive. And as to your relatives using Mepis or Pardus and enjoying them…maybe…but Pardus has not been produced for several years and only 'Turkish-language-ONLY' knockoffs like Pisi and Pardus Anka are trying to fly in 2013. So they are either using an unsupported Pardus 2009/2010 with no known repositories or Turkish is their mother-tongue. As to pleasing Windows users: without attracting them, desktop Linux will die on the vine. We ALL came from Windows and to deny that fact is self-deluding. I have a penta-boot system and of the 5 operating systems, 4 are Linux. I still need Windows 7 occasionally to run costware that has no equivalent in the freeware world. As Windows 8 is such a comprehensive disaster in the marketplace with PC users, if there ever was a time to win legions of them over to Linux, his is it! If Mageia wants to be in he fight they still have a lot of work to do. "All come from a windows background" ? Sorry, not me. And in no way is Ms windows more intuitive than Linux. (Really bizarre, if you have ever compared Msw administration with the much simpler and more coherent administration of Linux. I would say that most active in the development of Linux come from (or have a lot of experience in) a non Msw background, and that is all that is necessary for Linux to survive. There are a few apps not readily available in the Linux world (at a reasonable cost), but most Msw-compatible apps will run under wine, so Microsoft is not really necessary. The problem with this review is that it is incomplete. Obviously by someone inexperienced in reviews, who chose to try what is essentially a testing version (and probably only a CD, instead of a DVD). Had he been more experienced, and more detailed in the info he provided, the conclusion would probably have been less disfavourable in tone. Although essentially, there is little in the facts he related that could be considered very negative. Had he tried a regular installation version, he probably would have had more positive installation-related experiences as well. It is not as though there were any negatives of substance presented. I have been an a Linux user and have tried several distributions (Redhat/Fedora/SuSE/Arch/Mint/Mandrake/Mandriva) and found Mageia to be the best. The trick for me was to know that Mageia Control Center exists and it works. 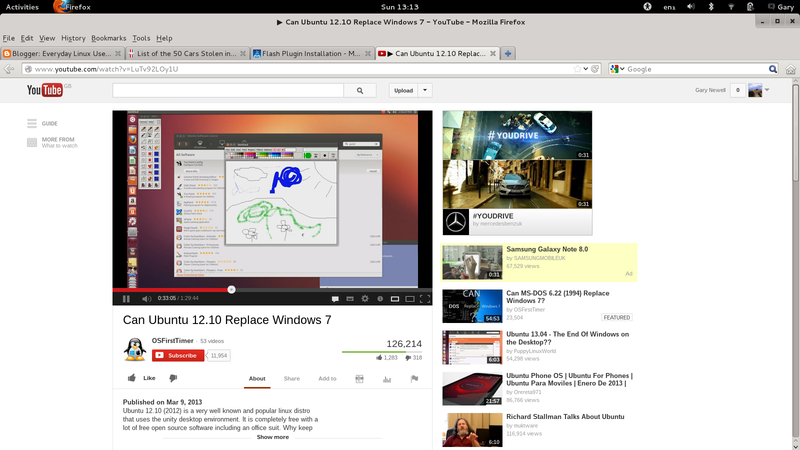 Of course I use KDE now though earlier I liked Gnome 2 better. Do you mean the publicity photo of Kaley Cuoco, the lead actress of one of the most popular TV shows this year? She's fully clothed, making no obscene gestures, etc. To what exactly do you object? Hi. It's a shame Mageia did not work for you. I have used Linux since the late 90's and used many different distros. I believe the partitoner, inherited from Mandrake, is very logical and effective. I guess you know that Mageia, by default, does not use GRUB2. So that is probably why your existing (GRUB2?) install/s were not picked up? Did you use the 'dd' method to create the Mageia bootable USB? And the 'dd' versus unetbootin method is not unique to Mageia anyway. Oh, even though Mageia may provide several DE's, I think it is best as KDE. If I were to use Gnome3, I would probably use a 'more Gnome-oriented' distro instead anyway. Let's face it, historically, that's how certain distros are. regardless of available DE's. All things considered, I think the Mageia team have done a supreme job in the timescale, and have created a very important foundation in terms of community and structure. I think people just don't appreciate the scale of effort to produce such a foundation. The distro works – and works well for me. Sure, a product can be 'polished', but the foundation is the prime importance. I tried Mageia 1 & 2. As of version 3, I think Mageia is going to become my day-to-day distro. Thanks for the reply. 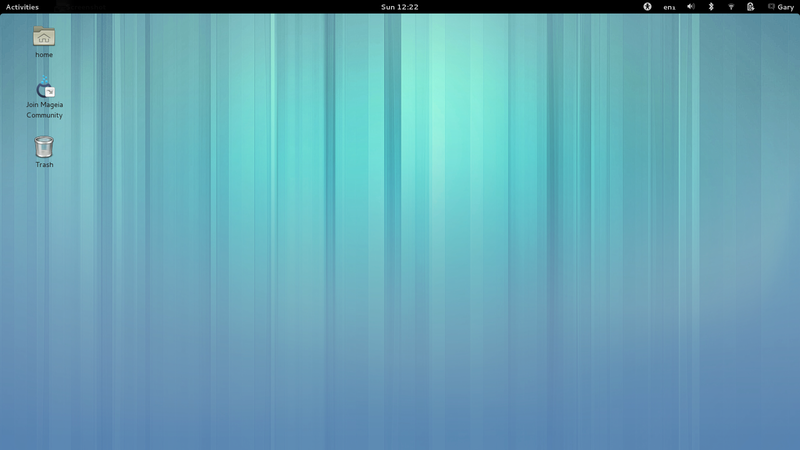 Finding a pure Gnome-oriented distro isn't as easy as it seems. I run a minimal install of Mageia simply for the lovely boot menu screen that comes with it's version of legacy GRUB (hey, I have a 2TB HD so why not?) and Mageia 3 flawlessly identified the other 4 Linux OS I have installed – all of which use GRUB 2 – so you are mistaken in that. You write: "The thing that bothers me is that Mageia is clearly so acceptable to so many which means there is something that I am missing. I would like to know why nobody else experienced the same issues as me." Well, I used Mageia 1 & 2 for a while and installed 3 without a problem, too. Mageia is one of my favourite choices for an OS, the only thing, that holds me back, is my dissatisfaction with the fancontrol on my thinkpad. As mentioned above, Mageia uses GRUB as default, therefore it's no surprise, that your other GRUB2 distros dissappeared in your GRUB-menu. At the end of the install, you get the choice to use GRUB2 instead of GRUB and in my case that worked very well with the final version of Mageia 3 (something that didn't work with the Beta-Version). But to be honest, GRUB/GRUB2 is something, the people at Mageia have to work at (especially if someone installs new distros beside Mageia). Partitioning is no more or less complicated or easy as with other Linux-distros or Windows. You have to know, what you're doing, and you've to inform yourself before the install about the installer and the partitioning-tool. That's all. I think, that with Mageia you've even more options during the process than with Ubuntu or Manjaro. 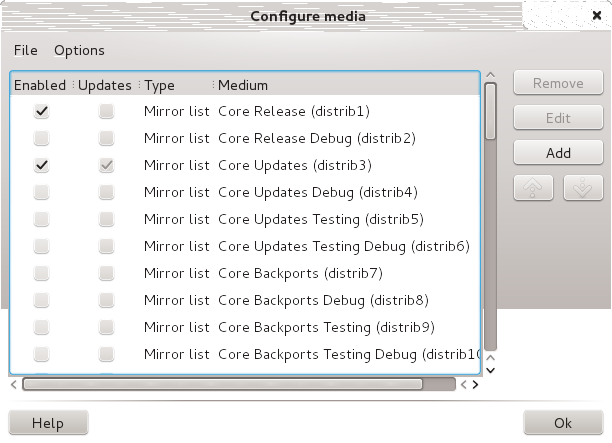 As with the repositories, normally the mirrors are synchronized during the first boot-process (unless you reject to do it). 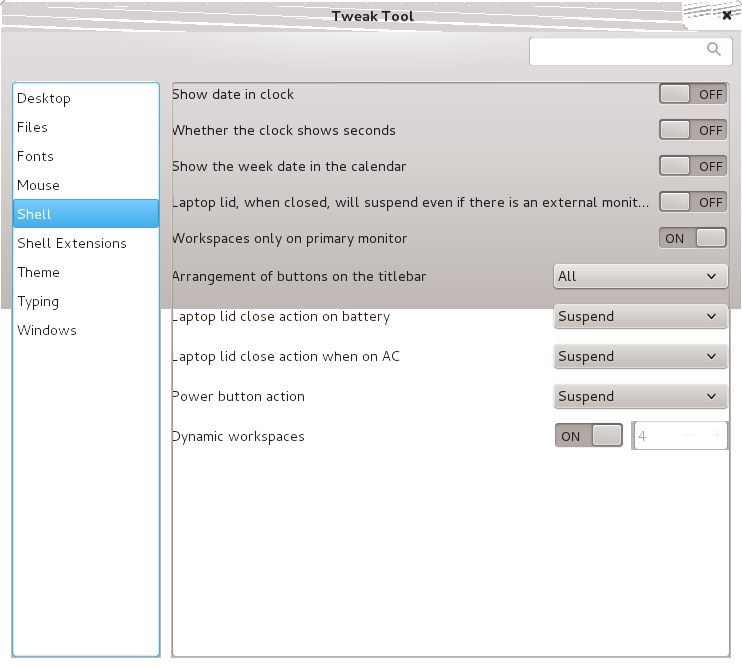 And finally: one of the first steps, after you installed any new OS, is to look for the central system setting tools. And if you want to change more than just the color of the icons (like to add the tainted repos in Mageia), you have to inform yourself what's possible and what's not, what's easy and what's complicated. That's another point, where Mageia is not different from other Linux-distros or Windows. 'Out of the box' does not mean, that the user is out of order. Linux-distros like Mageia are made by enthusiasts mostly in their spare-time and are free to use. To expect the perfect solution is unrealistic and kind of unappreciative. Even in Windows the average user will fail during an fresh install and in the long run with the system, without being informed and interested in the things that's going on at the computer. The point with Mageia (and Linux in gerneral) is, that you get a very good out-of-the-box experience and you get a lot of choices and chances and options to change the system to your liking. All you have to give as reward is your interest and your time and some tolerance and a good portion of gratitude. Your review of a fresh install sounds like the mindset and expectations of a user used to a preinstalled OS, but i think, that's not the case with you. Nevertheless it would've been more useful, if you would've written your review after checking out, what were your faults (e.g. in the forum) and what were really Mageia faults (or where Mageia didn't or wrongly informed and guided their users) before rating it. A very well thought out and elegant response to the review. I do however think there are other distributions that are of a similar size to Mageia that are more elegant out of the box and have less issues across the board. It isn't that Mageia is particularly bad and there is no issue that I raised that I couldn't fix without putting in some effort but I can get to the same place quicker with other distributions, especially if I choose to use Gnome as the desktop. Well, like everything kind of a question of personal perspective and preferences. What confuses me a little bit is, that you criticize some of your problems with the installation and the set up of Mageia, whereas in your review of PCLinuxOS you seem to have no issues and declare the installer as one of the best ever used. Nevertheless both often use virtual the same tools (like DrakX and the Control Center). In my case Mageia is in my top 3 of the combination "best out-of-the box experience for me with fewest time spent to set up the desktop to my preferences to act and look fine for me". The other two are CrunchBang and Chakra. Thus said, every Linux i've tried over the years had its own character and tiny bad habits. Even those three had and have its rough edges here and there and some of my comfort today results in dealing with those probs in the past. I think, that's the part of Linux, that makes fun and is satisfying for users like myself, who are average but interested. And therefore there are no good or bad distros out there but simply distros more or less for my (or your) liking and demands. And for the average users, who only want a perfect out-of-the-box experience right away without the time and the interest to know, how their system is running and behaving? Nothing wrong with them, 'cause luckily there are more important things in live than computers and software. And give them a pre-installed stable LTS-version with security updates enabled. Than they can have a lot of productivity and fun with Linux, too. But let them install Mageia, Ubuntu, Mint or Windows by themselves and the fun is over, for sure… . "The thing that bothers me is that Mageia is clearly so acceptable to so many which means there is something that I am missing." welcome to my experience with elementary os luna! and yet the net is abuzz with this "osx and windows alternative that Just Works." ubuntu, manjaro, and a host more of robust, well-accepted linux distros Just Work quite a bit better, are plenty sleek, and considerably more approachable for a non-linux user (captain windows is not going to know that it's time to sudo apt-get libreoffice when wondering where the office software is). elementary claims to be what scores of linux mint lovers have already found. re: mageia 3 itself, it's a bit buggy, and particularly hostile to casual virtualization. i could deal with using it though. still would rather continue my trifecta of manjaro, ubuntu-or-crunchbang, and centOS. Whats all the fuss. Use a well supported distro like OpenSuse. It always works well – Mint has gone to the Kernal requiring PAE. I have a StinkPad IBM old crappy laptop and OPENSUSE as up to date as it is and well supported >> Easily Runs on my Crappy Laptop. Yeah, those mandriva forks are definitely a different animal. I have used Mageia 2 and 3 and felt they were okay but prefer others (Debian, Ubuntu, Fedora)Also PCLinuxOS was challenging but I seem to have gotten use to it as the last version runs well. The Samba Server Mageia and PCLinuxOS use needs to go. PCLinuxOS challenging? Strange viewpoint. It is actually one of the more beginner-friendly distros I reckon. Well, nothing against PCLinuxOS, a very fine distro, but you've heard about that annoying shutdown-bug? You shut down your OS and it reboots straight after that. I've experienced it, too (but may have read somewhere, that it also affects some Mageia and Mandriva installations). So nothing better or worse with PClinusOS than with Mageia, i think, with those two distros it's more a choice of preferences than performance. I agree with you, that there is no guarantee, that Mageia may survive the next five years. Just like every community driven distro. Remember the problems chakra linux has right no because of lack of manpower. But the same could be said of PCLinuxOS. Maybe it would benefit both distros, if they would merge their knowledge and manpower (like Razor-qt and LXDE did), cause both have a lot of strenghts but still some weaknesses. As a volunteer member of the Mageia team, I thank you for your thoughtful and well-written review. I will be presenting it to the forums and mailing lists to see if we're addressing these issues with the alpha for Mageia 4. I confess I'm not having these problems — but then I'm not multibooting and I don't use GNOME. As for "verifiable clickfraud", as I read elsewhere in the comments… this is a serious concern. How/where can I learn about how this allegedly happened? Thanks for reading the review. I really want to get the same experience out of Mageia that others seem to enjoy so much but alas it hasn't happened for me thus far. Maybe version 4 is the one that will do it. With regards to clickfraud on Distrowatch there isn't much you can do to stop people who like your product clicking the link over and over. It is up to Distrowatch to worry about that. GNOME 3 *requires* NetworkManager and interacts with it directly. All you have to do is open the GNOME network applet, and NM will identify the WiFi access points. Mageia KDE will not, by default, use NM and still uses the Mageia network applet. This is not unique to Mageia. Mageia segregates software into three categories: core, nonfree, and tainted. Core is FOSS and is legally usable anywhere. Nonfree is vendor-provided software distributed without source, and is segregated from core only to allow users who prefer FOSS-only systems to avoid it. It is also legally usable anywhere. Tainted (which is where your codecs live) is software which violates copyright or software patents somewhere in the world, e. g. the USA. It is segregated from core/nonfree to prevent the default install from producing a system which would place users in such countries in violation of the law, and also to allow mirrors in such countries to mirror everything except tainted. If you use the full install, you'll note that the installer gives you the option of enabling additional repositories by clicking checkboxes. Nonfree is enabled by default, but you'd have to check the boxes to enable tainted. On the Live installs, some tainted stuff is included for demo purposes (I've never understood the logic of this). One of the realities to which you must commit in using Linux is that unlike commercial OS's, Linux doesn't license anything from anybody. Alternatives exist, but you have to explicitly choose them. To provide them OOB would put others in legal jeopardy. The original install repositories, be they Live CD or DVD, are left in place because many users who install from these non-network media have no network access, and to delete them would leave them with nothing. The Control Center Software application is there to allow users with network access to enable full repositories exactly as you did. You can choose an individual mirror, or allow the software to select one for you from a database. Just point and click. But it has to be your choice, since the system can't know your desire. for me the mageia 3 is the best distro ever for the fact that i could pin point the right nouveau driver that fits my laptop and get the max resolution for the screen that i could not get with any distro for thé last 3.5 years. even though my notebook is from the last decade i had no problem with installation what so ever . I have installed Mageia 3 KDE dvd install, not live cd, been using it for 2 weeks now, I haven't had any kind of problems at the moment, nor any single crash, Mageia 3 is IMO one of the best Linux distro with kde DE around, easy to install easy to use, I have used in the past more than 10 linux distros and tested more than 30 linux distros, Mageia looks like a keeper! Guys.. can anybody tell me if maegia 3 is compatible with windows 8 ????? bcoz ubuntu has some installation issues with windows 8's UEFI firmware…. i want to install in on my samsung series 3 laptop. a simple installation procedure would be even more helpfull.. When I was first starting to use Linux a couple of years ago a was truly a newbie (still am), and when I say newbie I mean "from what button do I turn this computer machine on?" type of a newbie. And being such a newbie, it is odd that I have never had any major problems with Mageia 1,2 or 3, all of wisth are extremely buggy and difficult to use? I have tried other distros (Ubuntu, Kubuntu, Mint, #!, Trisquel, CentOS, openSUSE…) and with all of those I have had much more problems than ever with Mageia (and I am not trying to say that Mageia is by any means perfect). So it is very strange to hear somebody say "Ubuntu = Easy, Mageia = Extremely difficult". But I guess it has to do with what ever anybody gets used to, when they first use an OS. And if they try another OS, that does things a bit different it is concluded as "difficult", "strange", or "stupid". Also it feels that what ever hardware people happen to have play a big role in what their experience of a different distro is going to be like. Also what I found strange from the comments (and between the lines of the review) was the sort of a hostile attitude towards Mageia and the possible popularity of Mageia. Why is this? What does it really matter who is number one in Distrowatch? Is it not clear to everyone that the Distrowatch count does not in any way reflect the actual number of installations of a distro? So what is the big deal? Is it because a distro that you do not like is higher on the ranking (on a list that has nothing to do with anything real) than the one you think is the best in the world? And even so, why the hostility? You are of course right. What one person sees as logical another sees as illogical. Different hardware, different workflows and different outlooks determine why some of us like one distribution and why others like another. I wasn't being hostile to Mageia within the review. I think it is an OK distribution… that is about it really. not brilliant, not rubbish. In the past 5-10 years, I've tried Mandriva/Mageia several times (including a few days ago) and each time, I was almost embarrassed to admit my feelings, as this has been such a wildly popular and lauded distribution. I'm all for choice, and I hope that those who use it continue to love it, but like Gary, I've always found it bloated, non-intuitive, and having a weird approach towards downloads, live-CD mode, and installation. Oddly enough Mandrake was the first distribution that I tried that I could manage to get to work. The only reason I didn't stick to it back then was the lack of hardware support. I then moved to openSUSE which was just brilliant at the time and is still pretty decent today. It is amazing how different people have different experiences with the same software.